Alumni coming from India, Korea, Philippines and New York, USA joined during their business trips or personal travel. Twenty-five graduating classes, spanning 1987 to 2018 were represented. A few faculty and staff too rounded out the group. Friendships were renewed and new ones made. “I don’t know most of these people, but that doesn’t seem to matter. We share a very special bond as IUJers and talking to everyone is so amazingly easy” expressed one alum from Bangladesh who just graduated in June 2018 and was attending his first such Bonenkai. Networking is a valuable part of any alumni gathering. This event allowed alumni who work at the same consulting firm to discover each other. Talks were heard among alumni planning to collaborate for a small Japanese island ecotourism development. An appeal for more support for job and internship opportunities was also made. One highlight of the evening was a warm-hearted speech by Prof. Mohammad Ahmed. 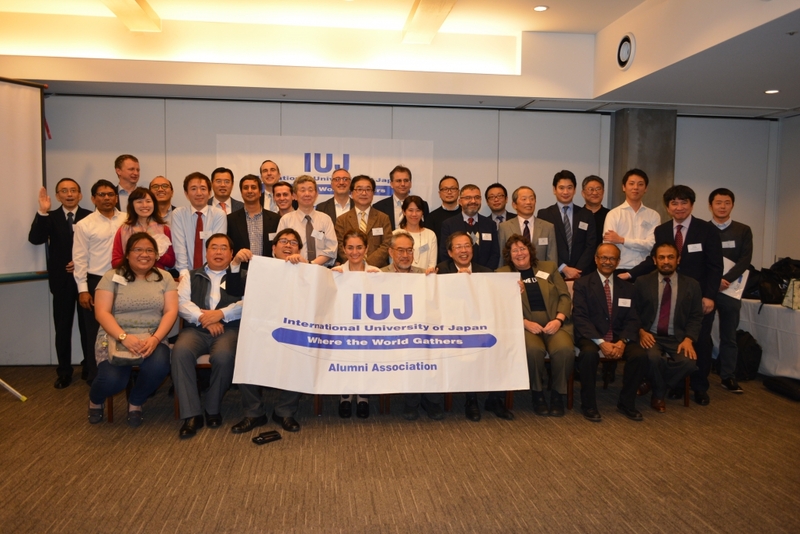 Ahmed-sensei has a 30 plus year teaching career at IUJ so was on campus with most of those in attendance. He talked about our special bond that can still exist over so many years, about how campus has changed but it remains the same friendly and supportive family atmosphere everyone remembers. He encouraged everyone to always remember their IUJ days, and value our relationships. With a video slideshow of photos from old yearbooks was playing in the background, the evening ended with some gift giveaways, and group photo sessions. Many lingered well after the event closed, and more went off to continue enjoying the evening together. Everyone is excited about the next opportunities to meet: April 27 for Open Day on campus, mid June for the Gourmet Marathon, next September for World Wide Friday, and of course Bonenkai 2019.